Key of Marie: New CD Tuesday - May 1 Edition! Before I start this first edition of a series I'm entitling 'New CD Tuesday', I wanted to pose a question and reflect a tad on this night. So the whole day after work, I felt like a zombie and super lethargic. At least once or twice, I could have succumbed and had my usual cat nap, but I persisted on and didn't (even going to the grocery store with my Mom). The funny thing was though was that even when it was a suitable time to go to bed, I got this sudden rush of energy and just went on a cleaning/organizing/being productive streak right before bed. It's like my brain finally clicked in and was like 'you know you are going to rest better if you tidy that space you've been putting off forever, right?'. And you know what? I honestly think I will! I've heard a few times that your space and it's cleanliness, or lack thereof, is a direct window into your brain. So if your room is cluttered and messy and unfocused, then so is your brain...BUT!! if your space is tidy and organized and focused, then it's easier for your mind to be as well!! And don't we all want a focused mind? I know I sure do :)...helps me write better reviews ;). Speaking of reviews! Here is my full scale one :)...enjoy! Right off the bat, gotta say...LOVE THIS COVER! So strong! 1. Good Girl - So...funny story behind this song. Supposedly my brother and my Dad were driving around Edmonton one day and this song came on. My brother not thinking anything of it was shocked when my Dad reached over and CRANKED this song and bobbed his head the entire time! It makes me laugh to think about it. I think my Dad and I share similar tastes because that's pretty much exactly what I do when I heard this song come on! It's a rockier edge for Carrie. The overall message reminds me of Cowboy Casanova...another Carrie favourite, but it definitely has an edgier sound than that one did :). 2. Blown Away - This song starts off a bit slower than the first one, but I think it's a good follow song and a great title song. The build up to the chorus has a techno edge and a sound to it, which is different and cool for Carrie. Looking at the cover art, you can also get a feel for this song as well. You can feel the wind starting to blow and the general carnage that is about to occur once this storm 'blows' through. The song is about a daughter and her abusive father, which seems like a different topic for Carrie to address, but I think she does it with an empowering sound. 3. Two Black Cadillacs - Oh wow...so I just read the lyrics to this song (which by the way, I love when artists include all of the lyrics in the booklet, because sometimes it's hard to understand the words during the song and I like to get the 'story' behind the song) and it's a very vengeful song. It's a 'power' song about two women who team up against an adulterous man and go after him and end his life. This is what I love about Carrie and her songs, she tells stories so well. It's not just music for the sake of music. It's what country music is all about. Telling about real life, not just the same chorus over and over again. 4. See You Again - Ok, gonna be honest, when I first saw this title my mind instantly went to the Miley Cyrus song of the same name that was popular a few years back. But this is definitely a different song! While that one was about a boy and legitimately seeing him again in a physical setting, this one is about losing a loved one and having to say 'goodbye', and ultimately seeing them again in the next life. A very heartfelt song that is quite typical of Carrie's albums. Not that that is a bad thing, but it is textbook for her to have one. Another song that clicked into my mind as I read the lyrics for this song is Goodbye's(The Saddest Word) - Celine Dion. 6. Forever Changed - Reading the lyrics to this song just confirm what I already know about reading lyrics to a song...they say so much! Reading this song and listening to it at the same time show a deeper, more personal side to Carrie. After reading, it seems to be about Carrie's mother and her slip into a state of forgetfulness and Alzheimer's possibly. This song hit me straight in the heart and has taken on such a deeper state than the songs previous to it. I love that Carrie was that vulnerable and open on a beautiful song such as this. 7. Nobody Ever Told You - Another thing I love about Carrie and female country music stars in general? Their amazing desire to give self confidence to every woman in the world! A very nice uplifting song, or like KoM (Key of Marie ;)) would say...a 'power' song! Very funky beat and nice and fresh. I feel like I should be on a beach, with a pina colada in my hand while a band plays this song live. Has a springy, summery feel to it :). 9. Thank God For Hometowns - This song could not have come on a more appropriate day. During a work road trip this morning, I passed a memorial on the road, that affected my community. Also, while touring another community, on the local radio there was an announcement that a member of my community had also passed away and their service would be that day. It struck me that this acknowledgement really showed the close-knit community that I come from. I love the town that I come from. I loved it before the May 15th tragedy, and I love it even more after it. The way that this town has come together and bonded and supported each other is just amazing. As an example, on May 17th my family and I will be attending a block BBQ with neighbours that I don't speak to everyday but still felt it was necessary to invite us. I love Slave for that. 10. Good In Goodbye - This song is genuine Carrie. Sending a message that gives hope and a realization that hey, even if this relationship doesn't work out, it will all work out in the end for the best. Even if that means you don't end up with who you think you should. Simply put, there can be good that comes from goodbye. Even though that may be hard to see at the time. Great message Carrie! 11. Leave Love Alone - So if song number 5 may be inspired by Mike Fisher, this one definitely is! Such an ode to love. You definitely feel that Carrie just radiates love and she is in such a great place in her life that this song must've come so easily for her. A happy song that is bright and fun. You need one of these songs on every album. A light fun song :). 12. Cupid's Got A Shotgun - What a 180 degree turn of songs from the last song! While that one was all about love and how great it is, this one is about Carrie shooting Cupid...whether it's because he's led her down the wrong road a time or two before or what..who knows. This is a fun, fast paced, 'power' song that is for the country girls who use Remingtons and know what a tree stand is and have been in one! I would love to see Carrie's video for this one! I think it would be super cute and fun! 13. Wine After Whiskey - Very sobering song. She talks about having a relationship and then losing it, and seeing that nothing could really compete with what you had. The story kind of reminds me of Katy Perry's - Thinking of You. It's kind of a regretful song about losing someone and not being able to ever fill the void that they left. A good country song with it's analogies based around alcohol :). 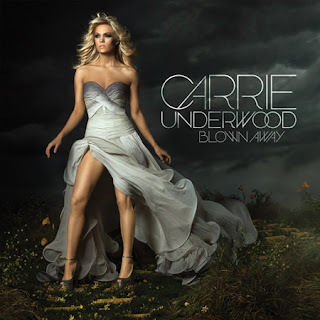 14. Who Are You - Ok, so if the first 13 songs didn't show you that Carrie is in love, and if you didn't know that she got married to the love of her life, this song definitely confirms it. A very declarative song about her love for this man. It could be taken in many different ways, but from my opinion it is about her husband, Mike Fisher. Very grown up and a very self assured declaration from Carrie. Great way to end an album that has been filled with love and maturity. Great job Carrie! Rating: 5 musical notes out of 5. I hope you guys have enjoyed my 'lengthy' review. I love doing these types of reviews as well as buying new music, so look for more of these in the future. Heck, I bought the new Dean Brody album today as well, but I'll save that and do a mini review on it later :). Hope you get 'Carrie'd away with something amazing today!